If the wind could speak to us, what might it say? 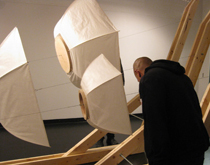 wind coil sound flow is an acoustic electromechanical system built by Winnipeg-based artist, Ken Gregory, that aims to find out by transforming wind-generated vibrations on a kite’s towline into harmonic frequencies. The first stage of this multi-part project, based on the principles of an Aeolian Harp, involved a large, one-stringed guitar played by the wind outdoors. The sounds generated through this system were recorded digitally and will be used to activate the long strings in the sculptural installation presented in Gallery 1C03 that, in turn, created new and complex sounds conveyed through kite-shaped audio speakers. Gregory has long been interested in exploring the complex relationship between humans and technology, and extends his practice now to investigations concerning the state of the natural world. He began thinking about kites while re-introducing the notion of play into his work, which led him into a deeply interesting sphere of research about the physics of flight, the historic, spiritual, and cultural significance of kites, and their mysterious, poetic, and metaphoric aspects. This project is the outcome of five years of development, during which time Gregory learned to design, build, and fly kites with a view to creating wind instruments. The Aeolian Kite Instrument gives the wind a voice that is similar to our own vocal chords. Gregory asks: if we learn to listen to the wind in new ways, might we soon be able to decode its songs? In light of climate change and other ecological urgencies, it seems critical that we consider such possibilities with creative sensitivity. wind coil sound flow was first presented at articule (Montréal) from April 3 to May 10, 2009. It was subsequently presented at Gallery 1C03 (programmed by Milena Placentile) in partnership with Video Pool Media Arts Centre (programmed by Przemek Pyszczek). This exhibition was recognized as adjunct programming of the 11th edition of send+receive: a festival of sound. The brochure accompanying this work includes a text written by crys cole, edited by Milena Placentile. This exhibition was generously supported by the Canada Council for the Arts and the Manitoba Arts Council.